Over the past few years, scientists have been intensely studying the flora (a.k.a. bacteria) of the human intestine to unlock the secrets it may hold in influencing our health. Scientists at Cornell University in New York have discovered a protein secreted by a particular form of bacteria which can shift control of insulin from the pancreas to the upper intestine. The pancreas is the organ which controls blood glucose levels in healthy individuals. If a person has type 1 diabetes, their pancreas is unable to produce insulin. In type 2 diabetes, the person’s cells are unable to utilize insulin correctly. Yet proper insulin control is crucial to health, as the hormone regulates how cells utilize blood sugar (glucose) to produce energy. If insulin is not produced or not utilized correctly, blood sugar remains in the bloodstream, creating a host of side effects. The Cornell research team, led by Professor John March, engineered a strain of Lactobacillus, a bacteria found in the human gut, to secrete a hormone that triggers the release of insulin in response to food entering the digestive tract. The team studied blood glucose levels in two sets of rats. One set received a pill form of the live bacteria, which was administered for a 90 day period. The other group of rats received a placebo. The scientists found that the bodies of diabetic rats which had received the treatment had shifted control of blood sugar levels from the pancreas to the upper intestine. They also found that the diabetic rats’ blood glucose levels were up to 30 percent lower than rats which did not receive the pill. But the scientists also discovered that the cells in the upper intestine of the diabetic rats converted into cells which mimicked pancreatic cells – the same cells which secrete insulin in non-diabetics. Interestingly, in those rats who were not diabetic, no change occurred in blood glucose levels. “If the rat is managing its glucose, it doesn’t need more insulin,”, Professor March said. It’s important to note that the probiotic used in the research is different from the probiotic dairy products widely available. The next step is to test higher doses of the medicine to establish if the probiotic could reverse diabetes altogether. The study was published in the journal Diabetes. Any diabetic will tell you that checking blood glucose readings is a real pain in the finger. Multiple daily “sticks” with a lancet and forcing a drop of blood onto a test strip connected to a blood glucose meter is to say the least, not appealing. It also can be difficult for some patients to perform and the cost of the test strips can become very expensive. As a result, some diabetics don’t monitor their blood glucose levels as often as they should. Unfortunately, their diabetes healthcare professionals absolutely rely on this method to make sure blood glucose levels of the patient are within normal range. For these reasons, scientists have spent years searching for a pain-free way for patients to measure their blood glucose levels. Recently, nanoengineers at the University of California, San Diego, developed a temporary tattoo which just may do the trick. The tattoo holds a flexible, highly sensitive glucose sensor which uses a mild electrical current to measure blood glucose levels. The tattoo is painless, as it simply contains electrodes printed on thin, disposable tattoo paper. The concept of a wearable blood glucose sensor is not new, however. In 2002, a similar device was marketed, called GlucoWatch. But the device was discontinued because it caused skin irritation in some patients, a reaction to the strength of the electrical current. But the UC San Diego sensor avoids this problem by using a lower electrical current to measure the glucose. None of the test subjects reported any discomfort while using the device. The diabetic tattoo was tested at UC San Diego and measured blood glucose levels in healthy patients as accurately as a blood glucose meter. The tattoo’s development is only a few steps away from providing the numerical values of glucose levels which diabetic patients and healthcare professionals are familiar with. This is a very promising step forward in noninvasive glucose testing for those with diabetes. The news for the residents of Philadelphia is not great when it comes to diabetes. Between 2002-2010, diabetes rates in the most impoverished neighborhoods of the City of Brotherly Love skyrocketed to an unprecedented percentage of population. So much so in fact, that Philadelphia now holds the not-so-wonderful title of largest city in the U.S. with the highest per capita diabetes rate. Health researchers at Philly’s Drexel University have been studying new ways to pinpoint who is most at risk for diabetes and its most common side effect, heart disease. “Just having diabetes actually increases your risk for heart disease almost as if you’ve had a heart attack already, that’s how profound an effect it is,” said Internist Ana Núñez, a lead member of the Drexel team studying health disparities related to cardiovascular disease. 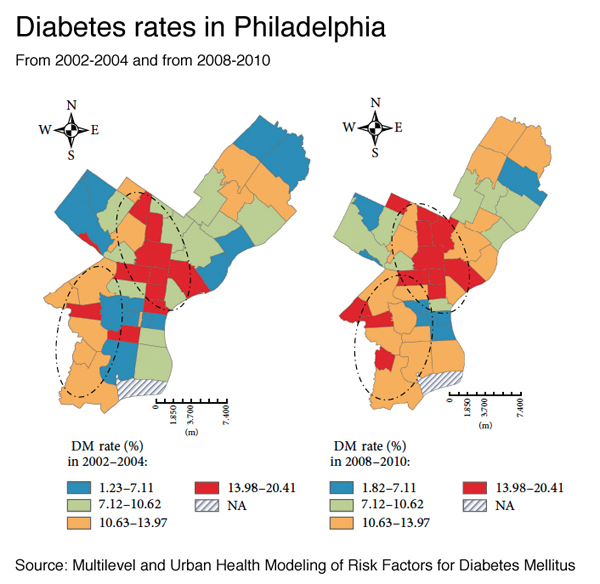 The map below shows the increase in diabetes rates by zip codes in Philadelphia. The red areas of the map represent diabetes density in the neighborhoods as high as 20.41% of the population, tan as high as 13.97 %, green as high as 10.62%, and blue as high as 7.11%. Even with the most cursory glance at the map, it’s easy to see the increase – for instance, note the lack of blue in 2008-2010 (right), compared to 2002-2004 (left). The red zones also happen to be the most underprivileged neighborhoods in the city. Part of the work at Drexel’s School of Public Health has focused on the health consequences of living in disadvantaged neighborhoods. No one can ignore the glut of fast food restaurants in these neighborhoods, but the diabetes problem runs much deeper and is more complicated than that. It’s partly education, partly cultural, and partly a lack of resources. The benefit of this information? It may be useful for policy leaders – both at the municipal, state, federal, and NGO levels – to invest in these regions to discover ways to bring down the diabetes rate and improve health overall. Can This Drug Reverse Diabetes? What a thought. A common drug, already on the market to treat a different disease, may be able to reverse the course of diabetes for millions of people. In type 1 diabetes, beta cells in the pancreas are attacked by the immune system. We all know the stats behind diabetes: it’s the 7th leading cause of death in the U.S. and contributes to heart disease, kidney disease, eye disease, neuropathy, and a host of other conditions. But researchers at the University of Alabama’s Comprehensive Diabetes Center will soon begin human trials to determine if a common drug prescribed for high blood pressure, verapamil, can stop the progression of diabetes and in some cases reverse it. In 2002, Anath Shalev, M.D., a diabetes researcher at the University of Wisconsin – Madison, started investigating what genes in the human pancreas responded greatest to high levels of blood glucose. In type 1 and type 2 diabetes, certain beta cells in the pancreas – known as islet beta cells – are gradually lost to genetically programmed cell death, for reasons unknown. As these beta cells are lost, diabetes becomes much worse. Shalev’s research on islet beta cells revealed that a gene in these cells was producing a protein called TXNIP, which previous studies showed is overproduced in beta cells in the presence of high blood sugar. Too much TXNIP causes beta cell death and inhibits the body’s natural production of insulin. For 12 years Shalev continued her research, eventually leaving the U of Wis to head the UAB’s Comprehensive Diabetes Center. Using cell cultures, mouse models, and pancreatic islet cells from humans, Shalev eventually showed that manipulating TXNIP could protect mice against diabetes or make it much worse. In 2012, building on research from other teams, Shalev started testing verapamil on human islet beta cells. She discovered that the drug reduced TXNIP, and halted the death of beta cells. Shalev also discovered that mice which were fed verapamil in their drinking water actually reversed the course of their diabetes, and the drug protected other mice against diabetes. The following year, Shalev’s team discovered that high levels of TXNIP actually blocked insulin production in beta cells. Clinical trials will begin soon to see if verapamil has the same effect on human type 1 diabetics as it does on mice. The three-year, $2.1 million trial will be conducted by the UAB Comprehensive Diabetes Center with funding from JDRF, the largest charitable supporter of type 1 diabetes research. This video simply explains what the UAB reserachers discovered and how dibetes effects beta cells in the pancreas. Among diabetes organizations, November is known as American Diabetes Month, Diabetes Awareness Month, and even National Diabetes Awareness Day (November 14). Regardless of the name, the purpose is to raise your awareness of this epidemic disease and its risk factors, and learn how you can avoid it or control it. Those statistics are nothing to take lightly. But if that weren’t bad enough, there’s a bigger crisis looming: Eighty-six million of us have prediabetes, which is chronic, elevated blood sugar levels which aren’t yet considered diabetic, but can quickly become so. Just a little bit of education however, can help you avoid developing diabetes and its many complications. For those already diagnosed with type 1 or type 2, use November to educate yourself about lifestyle changes you can make to control your disease, and schedule appointments with your physicians for an annual screening. ***All diabeteics should receive an annual screening from a podiatrist to look for early signs of numbness or hypersensitivity in the feet, which can be early warning signs of diabetic peripheral neuropathy. Visit our website to learn how to prevent diabetc complications in your feet. America Gets Cooking to Stop Diabetes is an initiative designed to engage and inspire people to live a healthier and more active lifestyle. The initiative encourages and empowers you to cook nutritious and delicious food and to be more active, with ideas like Get Moving Mondays and Tasty Tip Tuesdays. Get more info on America Gets Cooking to Stop Diabetes. NDEP is a partnership of the National Institutes of Health, the Centers for Disease Control and Prevention, and more than 200 public and private organizations. Throughout National Diabetes Month, the NDEP will promote “Be Smart About Your Heart: Control the ABCs of Diabetes” to help people with diabetes learn they are at greater risk for heart disease, and how they can lower that risk by managing the diabetes ABCs: the A1C test, Blood Pressure, Cholesterol and Stop Smoking. Get more info on the National Diabetes Education Program. JDRF, also known as the Juvenile Diabetes Research Fund, is an advocacy organization for raising awareness of Type 1 diabetes, the autoimmune disease one inherits from one or both parents. This November, JDRF is teaming with Thunderclap, a “crowdspeaking” social media platform that integrates with your facebook and twitter accounts. The concept behind Thunderclap is for everyone to share the exact same message on the same days on their social media accounts so that the JDRF posts have a chance to rise above the usual noise of cat memes and “5 Things You Can Do Right Now To…” posts. Get more info on how you can help JDRF raise awareness for Type 1 diabetes. Please join us in November in raising awareness of type 1 and type 2 diabetes. Schedule an appointment with one of our podiatrists for a diabetic foot exam. Over the past two decades, the occurrence of Type 2 diabetes in adults doubled. Now for the first time, according to new research from the Centers For Disease Control, the rate has leveled off – at least for some in the population. The CDC reports that the total number of people living with diabetes increased an average of 0.6 percent annually between 2008 and 2012, to the current 8.3% of adults. Do the math and that’s nearly 21 million people over age 18 with diabetes, in the U.S. alone. But the rates at which new cases are accumulating have slowed in certain population groups in recent years, a fact also confirmed in a report in the Journal of the American Medical Association (JAMA). The CDC researchers said that the change may be due to another positive trend – the stabilization of obesity rates in the U.S. Unfortunately, the rate of type 2 diabetes continues to grow among blacks and Hispanics, the elderly, and those without a college education, according to the JAMA report. Those with a high school education or less were more than twice as likely to develop Type 2 diabetes than those who have completed college. What’s being done to slow the growth of type 2 diabetes? Figures from the CDC show that nearly 48 percent of non-Hispanic blacks and more than 42 percent of Hispanics are obese, making them more vulnerable to developing type 2 diabetes. The CDC has had great success with its National Diabetes Prevention Program, a lifestyle change program that can cut a person’s risk of type 2 diabetes in half. However, the continued increase in diabetes rates among blacks, Hispanics and people with less than a high school education, reflects the difficulty in reaching these parts of the population with programs like the NDPP. The American Diabetes Association says that roughly 13 percent of U.S. Latinos have diabetes, but many of them are undiagnosed. At Alivio Medical center, on the east side of Indianapolis, great strides have been made in educating their Hispanic patients. There, Fridays and Saturdays are known as “diabetes days”, with a focus on diabetes diagnosis and treatment. According to Dr. Alfredo Lopez-Yunez, he’s seen “… an explosion of new diagnoses. We diagnose maybe 10 new patients a month, which is staggering in this relatively small practice. Even more concerning is that we’re diagnosing them at an earlier age.” Dr. Lopez-Yunez said that type 2 diabetes among Latinos in their 20s and 30s would have been unheard of ten or twenty years ago. “Right now I’m diagnosing people with Type 2 diabetes in their 20s, and this disease is going to be with them forever,” he said. The result of undiagnosed or unmanaged diabetes may be runaway heart disease, kidney disease, an impact on eye health, neuropathies, foot ulcers, and many other health complications.